So, after much struggle, I finished the swaps I had signed up for. Because I didn't have a clue what the end result was going to be, I muddled along. But the end result was worth it and I love my creation. I started with vanilla cardstock. Because I had spent and arm and a leg to buy Tim Holtz's craft sheet (basically, a silicone sheet that is 15 x 18 inches) I was determined to use it. I randomly inked my fired brick distress ink pad on the sheet along with one of the browns (not sure which). Then I spritzed with water and gently laid the cardstock in the puddles. I was really surprised with the softness of the brick red as it looks more like the colour worn lipstick. The dappling efect of the colours are so gorgeous- am definitley going to be making lots more backgrounds like these. I had also purchased a retired set-Botanical and was anxious to use it. I overstamped in vintage photo (or was that tea ink?) the french script fromt that set and then spritzed it to get a softer look. The red poppy was stamped in Timber brown stazon (my new favourite ink, now that I've gotten over the smell of the pad) and coloured in with some cheapo coloured pencils. I also used Stampin' Up! 's marker olive, to colour the leaves. 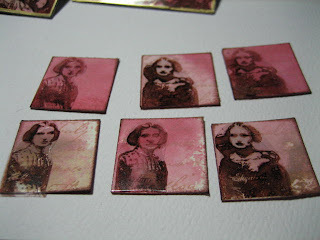 I had gotten a Paper Artsy stamp set ( Buttons, Plate 4) and wanted to incorporate what I thought were theBronte sisters stamp in my ATC so I stamped it on a transparency and cut them out to overlay it on the main ATC. The "pin" part of the ATC was also fun to make. 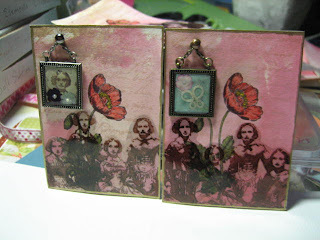 Dollar store embellishments were used- they are "mini frames with brads". 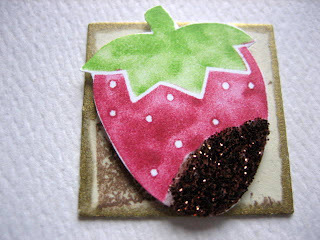 I learned this from my friend Robin at our last stamping get together (thanks, Robin for sharing with us this idea). I used crystal effects to hold together a "scene" I created with mini mulberry flowers. The original plan was to tat little butterflies and use them in the frame but I've misplaced my tatting shuttle and threads so I used the image from the sisters instead- colouring them in with chalks. I backed my ATC with cereal box cardboard and I also edged them with my Zig gold pen. So now, I was also in some inchie swaps as well and so I had leftover "sisters" from the transparencies and I cut them out carefully and layered them on my inchies. I like how it turned out. Here are some other things I had worked on in the last little while (before my dry spell). Oh, your ATCs are so wonderful! A lot of work but totally worth the effort!! I wish I lived closer so I cold come and get me some of those yummy looking red red raspberries!!! I have been working on some inchie "things" but not quite ready to post. You'll see them when I do :-) Hope you enjoy your weekend! July 31, 2008 at 8:55 p.m.
August 4, 2008 at 3:22 p.m.
August 7, 2008 at 11:48 p.m.
August 15, 2008 at 9:10 a.m.